SYDNEY, AUSTRALIA – NSW Ports, a major box port operator in Australia, is being sued in the nation’s Federal Court by the national competition watchdog, the Australian Competition & Consumer Commission (ACCC). The ACCC will allege in its lawsuit that NSW Ports, which operates the box terminal at Port Botany, Sydney, entered into an anti-competitive deal with the state government of New South Wales. The watchdog alleges that the deal effectively cripples the development of a rival port 175km (107 miles) north at Newcastle and grants monopoly status to NSW Ports in the local box port market. The ports of Newcastle, Botany, and Kembla (a dry bulk port to the south of Sydney) were formerly all owned and operated by the state government. It leased Botany and Kembla in a single deal in April 2013 to a consortium of investors for just under A$5.1 billion (approximately US$5.33 billion at April 2013 rates; the Australian dollar has since plunged in value relative to the greenback). Then, about a year later, the state government leased Newcastle for A$1.75 billion (then approximately US$1.63 billion), to a separate consortium of investors. All three deals were shrouded in controversy and secrecy. It was controversial as Kembla had earlier been designated as the site of the next major container terminal in New South Wales – despite the presence of a large escarpment between Kembla and Sydney, and little access to freight-transport infrastructure. Newcastle was at the time of privatisation, as it has been historically, a coal export port. However it had then, and still has now, access to extensive road, rail and aviation infrastructure that could be used for intermodal freight transport. Meanwhile, local media, logistics analysts, and politicians attempted for years to discover the details of the privatisation deal. And to no avail. But, in July 2016, the “Port Commitment Deeds”, which contained the details of the deals, were anonymously leaked. Those documents revealed that every time Newcastle moves a container above a certain volume of box lifts then it is required by the port commitment deeds to pay a fee to the state government. That fee is equivalent to the average price of about A$150 (approx US$108) charged by NSW Ports for box moves at Botany. And here’s the kicker: the port commitment deeds then require the state government to pay those monies to NSW Ports. The ACCC argues that the deeds effectively render uneconomic the development of a box terminal at Newcastle. The watchdog is therefore asking the Federal court for injunctions to prevent NSW Ports from seeking compensation for box movements at Newcastle. Freightwaves today spoke to independent logistics analyst, Greg Cameron, who was instrumental in bringing the details of the deals to light through his extensive lobbying of media, politicians, regulatory authorities and industry executives. Mr Cameron argued that, if the offending provisions in the port deeds are struck down, then Newcastle, which is currently a coal export terminal, will likely move to build a two-million-container capacity box terminal. By way of comparison, Botany handled about 2.7 million twenty-foot equivalent units (TEUs) in the 2017/2018 financial year. “It is a highly logical conclusion that coal will give way to containers. The [Newcastle] owners will likely dump coal the second that containers make money than coal,” Mr Cameron argued. If the ACCC is successful in striking out the restrictive covenants in the privatisation deeds then there will be significant implications in the patterns of long-haul trucking along the east coast of Australia. 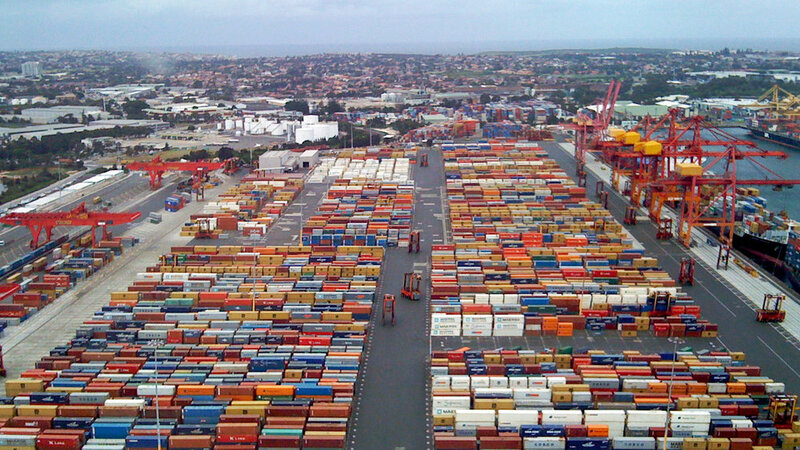 Today, much containerised freight is currently trucked south to Botany from the region around Newcastle. Northern New South Wales shippers would be able to save anywhere from 3% to 15% on truck freight costs if they could send freight to Newcastle instead of Botany, according to research by the Port of Newcastle. Allowing Newcastle to begin box terminal operations would see the port attract a 500,000 TEU throughput, rising to 1.1 million by 2050, according to a report by Deloitte Access Economics. Mr Cameron also pointed out that the hinterland of a Newcastle box terminal would reach into Northern New South Wales and southern Queensland. Such a catchment raises the implication that trucked cargo freight into Brisbane (a southern Queensland city) would also become more contestable.